Gallipolis is a beautiful, small city located on the Ohio River in southeastern Ohio, midway between Pittsburgh and Cincinnati. The name derives from the Latin “Galli” for Gaul or France and the Greek “polis” for city. It is familiarly known as “The City of the Gauls” and “The French City.” Settled in 1790 by men and women from France---the group poplularly known as the French 500---it has a rich historical background, much of which has been preserved in the Our House Museum, an early hotel visited by numerous prominent French people of the day, including the General Marquis de Lafayette. We are the Gallia County Genealogical Society, OGS Chapter, Inc. and operate as a non-profit organization. We are governed by a seven member board which is elected by a vote of the membership at the Annual Meeting in January. We hold monthly meetings at our office at noon on the second Thursday of the month except for July, August and December. The general public is welcome to attend but only members have voting privileges at the Annual Meeting and only board members have voting privileges at the monthly meetings. Participation is welcomed for all who attend. Members are encouraged to participate at all meetings and are also welcomed as volunteers at the office. There is much going on at the society on a daily basis and people are needed to input data into a computer, to index probate records, to help those who stop in to research, to copy records and see that family history or other notebooks are kept current with received material, and to create photo albums or scrapbooks. Current projects also include sorting through Civil War data and transcribing funeral home records. We generally hold several events during the year, such as book signings for local authors, (and we also have their books for sale--see Publications). These events will appear on the calendar when they are scheduled. Sometimes we cosponsor a Help Event for Scouts and 4-H members with the Bossard Memorial Library and every October we sponsor a lineage society banquet during which ancestors are honored and new members are accepted. Please stop by our office and observe what we are doing. Our main goal is to help researchers and to preserve the records of Gallia County by copying or transcribing and compiling whatever is necessary. Also feel free to contact us with any suggestions or concerns. In 1982 Henny Evans noticed a real interest in genealogy in Gallia County and suggested that a chapter of the Ohio Genealogical Society might be a good idea. She contacted the state level and determined that we would be in the Athens District. O.G.S. put her in contact with Beverly Schumacher of Athens and she came to Gallipolis to explain what might be needed. It was learned that a group of fifteen was necessary to get a charter. In January 1983 the Gallia County Genealogical Society held its first meeting and the elected officers were Henny Evans, President, Mary James, Vice President, Mary Ann Wood, Recording Secretary, Maxine Northup, Corresponding Secretary and Mike Brown, Treasurer. The new group discussed many potential projects and eager to start, they agreed that their meetings would be workshops to work on records. If the group could get fifteen members we would be chartered in April at the O.G.S. Conference. Henny Evans and Mike Trowbridge were elected as delegates to attend the conference and Mary Ann Wood and Dorothy Frazier also attended. The great news for us was that we had already grown to seventy-five members by the time we were chartered. We found a list of the first eighty-two members and see that seventy-five of them were charter members. We thought maybe you might like to see the names of the first group of members. They included Marilyn Adams, Elinor Atkinson, Kathryn A. Baker, Irma Bales, Mary Blazer, Richard Bradbury, Catherine Brown, Michael Brown, Maj. Gen. George Bush, Elmer Caldwell, Betty Cantrell, Patricia Compton, Mr. and Mrs. Byrle C. Cosner, Jr., Jane Daniel, Evelyn Dantz, Esther Jo Dodson, Kathryn Donohoe, Naomi Durst, Ralph Durst, Nancy Hanks Ewing, Louise Gravely Eden, Henrietta Evans, Evelyn Fish, Dorothy Frazier, Susan Frazier, Martha Fuller, Bess Grace, Dr. and Mrs. James Grooms, Madge Hauldren, Wilma Haycraft, Betty L. Hemphill, Cristi Hemphill, Douglas E. Hosley, Maria V. Isborn, Mary James, Harris Jensen, Beulah Johnson, Irene Q. Johnson, Phyllis Johnson, Cheryl Knowles, Martha Lear, Betty L. White Long, Maxine Marshall, Sandra Maskew, James McCafferty, Jane McCafferty, Helen Mertian, Elisabeth C. Marshall, Thomas Moulton, Charles Murray, James Myers, Mary W. Niday, Maxine Northup, Don O’Rourke, Betty Jo Owen, Wanda Parsons, Delcie Pound, Mayburt Riegel, Naomi Ringgold, Maxine Roark, Mr. and Mrs. Jack Russell, Georgianna Rutherford, Marian Schoonover, Doris Schultz, Rudy Schultz, Eva L. Slater, Clark Stine, Anna Louise Stitt, Lola Mae Suiter, Albert Tangora, Ruth Tap, Robin Townsend, Sybil Toops, Michael Trowbridge, Mrs. Robert S. Tuite, Olive Vieira, Miriam Wood, Mary P. Wood, and Denver Yoho. During the past twenty-two years since we were chartered the group has grown to several hundred members. 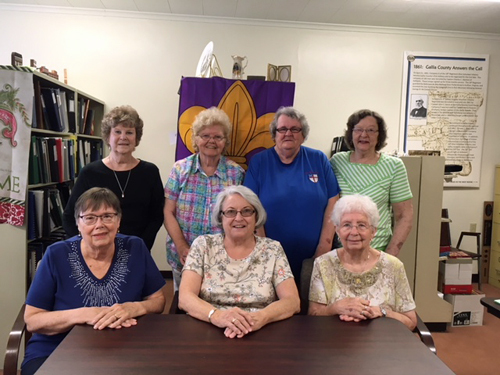 Our chapter has been very active in publishing books, preserving records, sponsoring chapter management seminar, helping 4-H students with genealogical projects, participating in the state O.G.S. student essay contest, and attending conferences including the National Genealogical Society Conference in 1986 in Columbus . We started First Families of Gallia County, OGS, Est. 1990 through our association with the Ohio Genealogical Society. As of 2004 we had 572 members with 671 ancestors and it continues to grow yearly. We then started Civil War Families of Gallia County, OGS, Est. 2004 and chartered seventy-eight members with ninety-two soldiers. For years we were associated with the Gallia County Historical Society, but in November 2004, our by-laws were officially changed allowing us to collect our dues separately from them. We started doing this in December. At our January 2005 meeting, the group decided that they would like to see the chapter incorporate. It was voted upon and agreed to. Incorporation was of the existing group using their by-laws and three of the officers. No new group was ever formed. Due to a dispute over the charter, we re-applied and were granted a new charter in July 2005. Once again we are the only recognized OGS Chapter in Gallia County.